Light rays which are reflected by any surface can become polarized so polarizing filters are used to select which light rays enter your camera lens. 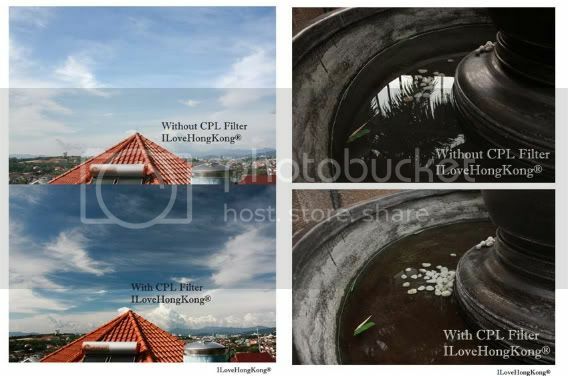 CIRCULAR PL filters allow you to remove unwanted reflections from non-metallic surfaces such as water, glass etc. They also enable colors to become more saturated and appear clearer with better contrast. This effect is often used to increase the contrast and saturation in blue skies and white clouds. Reduce Glare and Reflections with the CPL. Using the CPL filter, reflections and glare can be reduced significantly from non-metallic surfaces. A camera angle of 30 degrees from the reflecting surface (glass, water, etc.) is ideal for maximum effect. • Low reflection coating increases light transmission. • Lens’ outer rim is blackened to minimize internal reflection. • Ultra thin, matte-black metal filter frame further minimizes refection.